Three-quarters of chronic obstructive pulmonary disease (COPD) cases have their origins in poor lung function pathways beginning in childhood. These pathways are associated with exposures in childhood, and amplified by factors in adulthood, according to a cohort study published in The Lancet Respiratory Medicine journal. While smoking remains the biggest risk factor for COPD, the study demonstrates that childhood illnesses (such as asthma, bronchitis, pneumonia, allergic rhinitis, eczema) and exposures to parental smoking are also linked to the disease. A second study in the journal also suggests that there could be a window of opportunity during childhood to reduce the risk of poor lung function in later life. Both studies identified pathways of how lung function changes over life, which are associated with different risk factors and disease risk in later life. The authors say that these insights are important for lung disease prediction, prevention, and treatment. In the first study, 2438 participants from the Tasmanian Longitudinal Health Study (Australia) were tracked from childhood to the age of 53 – making it the largest and longest-running study of its kind. Lung function was measured at the ages of 7, 13, 18, 45, 50 and 53 years old, and participants’ exposure to various risk factors was also recorded. The authors identified six distinct pathways describing how lung function changes with age . Three of these pathways were associated with COPD – the group with below average lung function in early life and a quick decline in lung function in later life, those with persistently low lung function, and those with below average lung function. Combined, these three pathways were linked to an estimated three-quarters of all cases of COPD occurring at the age of 53 (75.2% overall). For moderate-to-severe COPD, all cases only arose from these three trajectories. These three pathways were also linked to childhood asthma, bronchitis, pneumonia, allergic rhinitis, eczema, parents having asthma or smoking, and the participants themselves smoking or having asthma. The authors suggest that the childhood risk factors are important indicators of COPD risk, that are aggravated by smoking and having asthma in adulthood. This amplifies the damage already caused by childhood risk factors, and may result in a more rapid decline in lung function. As a result, the authors say that it will be important to reduce parental smoking, encourage immunisation, and avoid smoking to promote healthy lung function pathways and minimise COPD risk, especially for people who had low childhood lung function or whose parents smoked. In addition, ensuring all people with asthma have appropriate treatment may be vital to preserve lung function. 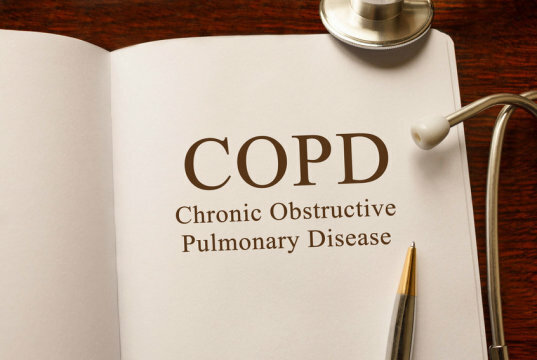 The authors note some limitations, including that the last measurement in their study is at the age of 53, when COPD is just starting to emerge, but most patients are diagnosed in their sixties. Therefore, tracking these lung function pathways later into life may give a clearer picture of COPD risk in later life. In the second study, 2632 participants were tracked from birth to 24 years old and their lung function was measured. The authors found that around three-quarters of infants aged one to six months with poor lung function improved throughout their childhood, indicating a window of opportunity to increase lung function and potentially reduce risk of COPD in later life. They suggest that interventions to maximise lung growth in early childhood might modify the risk of COPD in older age.